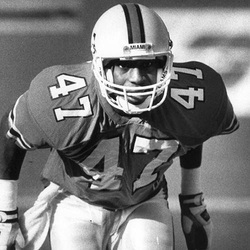 Arriving from Fort Pierce to the "U" in 1988, this born-to-be-a-'Cane left an indelible mark at the cornerback position. As part of the dominating Hurricane defenses of the early 1990s, Ryan McNeil was named All BIG-EAST after both his junior and senior seasons, and a semi-finalist for the 1992 Jim Thorpe Award. McNeil was named first-team All American by Kodak, Football News and the Walter Camp Foundation following his senior season. McNeil's leadership on the field as a starting CB contributed to two national championship titles, after the 1989 Sugar Bowl and the 1991 Orange Bowl. The 1991 season saw hard-hitting McNeil lead the team with five interceptions. A second-round draft pick of the Detroit Lions in 1993, McNeil's 12-year career exceeded the average length of an NFL career by more than eight years. McNeil brought his dominating style of play to the pro gridiron, logging over 600 solo tackles and 31 career interceptions. Not one to rest on his playing laurels, the versatile and enterprising McNeil founded the Professional Business and Financial Network, an organization for professional athletes to make their post-playing days as successful as their on-field careers. The PBFN and companion magazine, OverTime, are both premier resources for pro football players and business executives looking to partner with high-profile athletes. McNeil's extraordinary success in both the real estate and business world is no surprise to anyone who knew him in his days laying sweat down on the Greentree Practice Field and in the U's Business School classrooms.